I like having the opportunity to really combine my enthusiasm for a new game and my love of the carefully selected gamer product we carry. 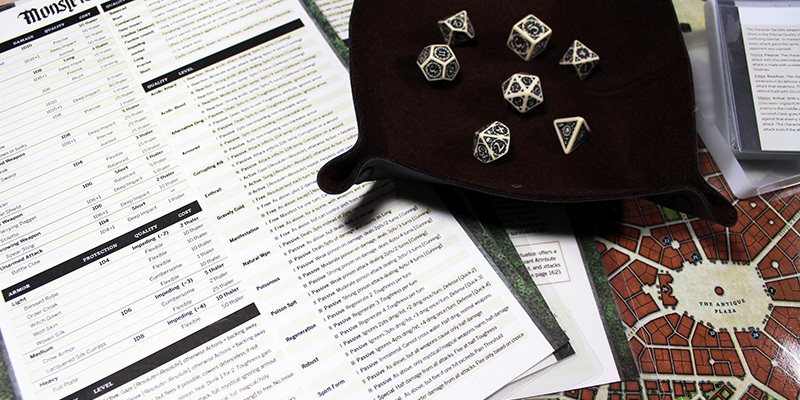 We really don’t stock anything that wouldn’t see use at our own gaming table – and here you can see that. I have been having a lot of fun with a recently translated Swedish RPG called Symbaroum, designed by the Järnringen team and distributed by Modiphius in the UK. So much fun I might have gone slightly overboard (that’s enthusiasm for you!). To be clear, the dice bag is not official. Fil obviously makes the All Rolled Up and she surprised me with this as a gift! The Davokar map on the outside is something the team recently released as a PDF and has been printed on fabric and fixed / sewn as a panel on the outside. 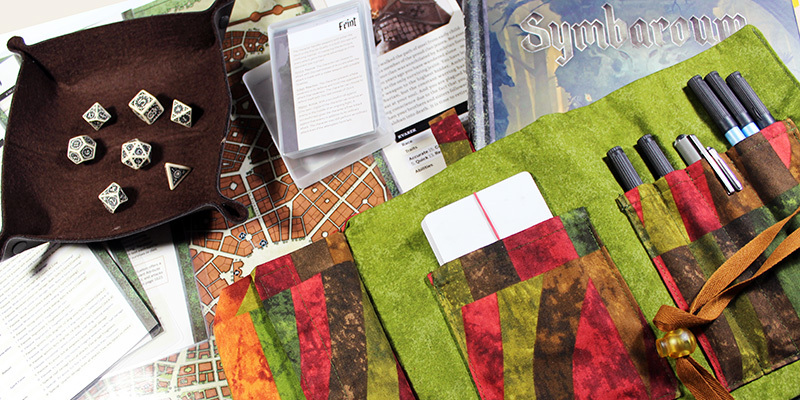 I’d commented to Fil earlier in the week that I thought the fabric would suit Symbaroum because of the Elves are tied to the seasons – here with brown (winter), red (autumn), dark green (summer) and light green (spring). I think it came out really well. And yes, I checked with the Järnringen team to see that this was OK (as is the case with all ARU we create using images belonging to someone else!). As well as the All Rolled Up, I have a Dark Brown Dice Tray and some nice Adventures in the East Mark dice from Q-Workshop (we have these at events when we sell dice if you’re interested!). I also used one of our clear Card Boxes to hold reference cards and had a couple of in-game maps printed as A2 laminated posters to use with the Staedtler Correctable dry wipe pens. Turned out very nice indeed. I’m looking forward to running a few games! 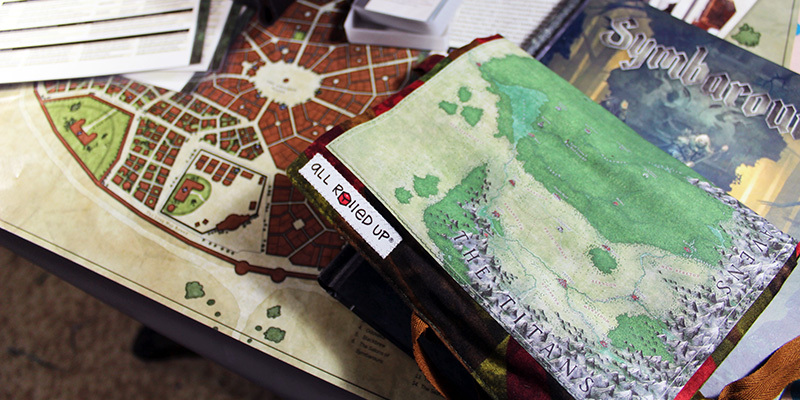 While I love the outside of the rolled up bag, I think, the inside does not fit the atmosphere of Symbaroum at all. The inside looks very colorful and light. But Symbaroum appears to be dark fantasy with a mystical and eerie feel to it. You just have to look at the artwork in the core rulebook to get what atmosphere they are trying to convey. 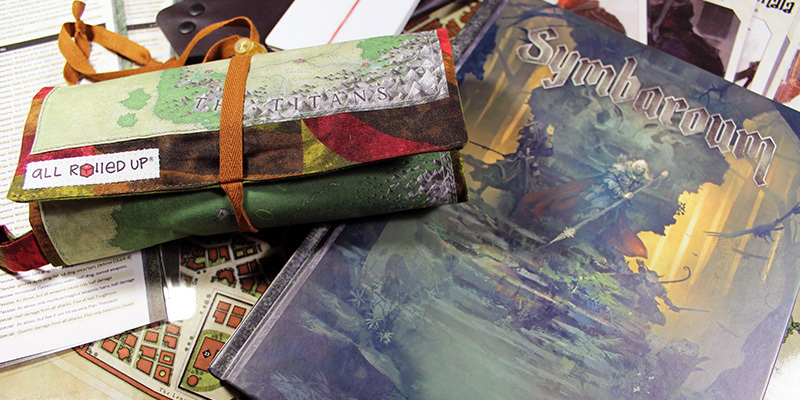 I would love to see a Symbaroum rolled up bag that reflects that, probably with muted dark green, brown or silver colors inside. The interior is intended to convey the seasons of the Elves and shows up a little brighter than in real life because of the contrast in the image. 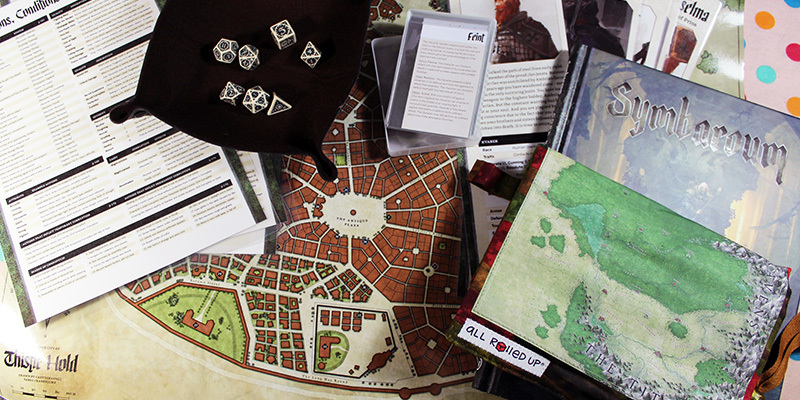 The other Symbaroum All Rolled Up – Dark Davokar – has darker colours, but isn’t pictured here. Thanks for your thoughts and feedback. They’re always welcome. Oh, can show you pictures of Dark Davokar? I also haven’t seen it in the shop.